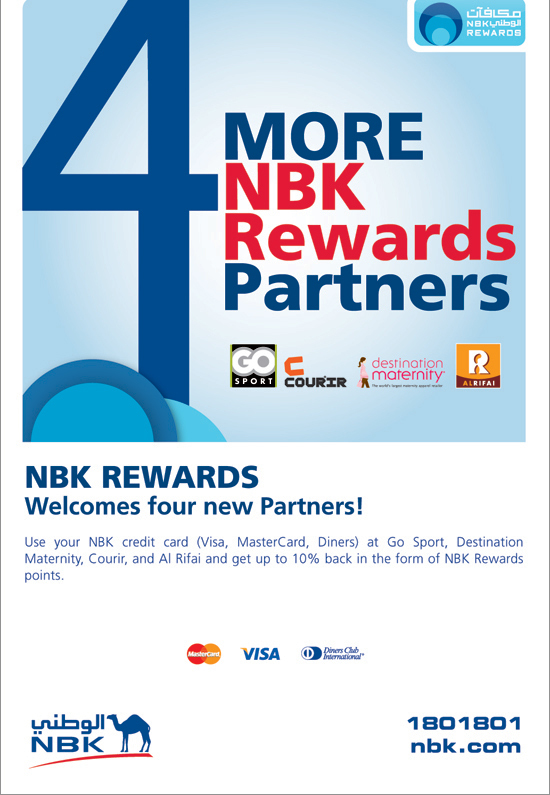 NBK has just announced the introduction of 4 new partners in their Rewards Programs; the most notable of the new inductions are Go Sport & Refai Confectionary. The hours are flexible, can either be during the morning shift or the evening ones. The minimum requirement is a high school diploma. 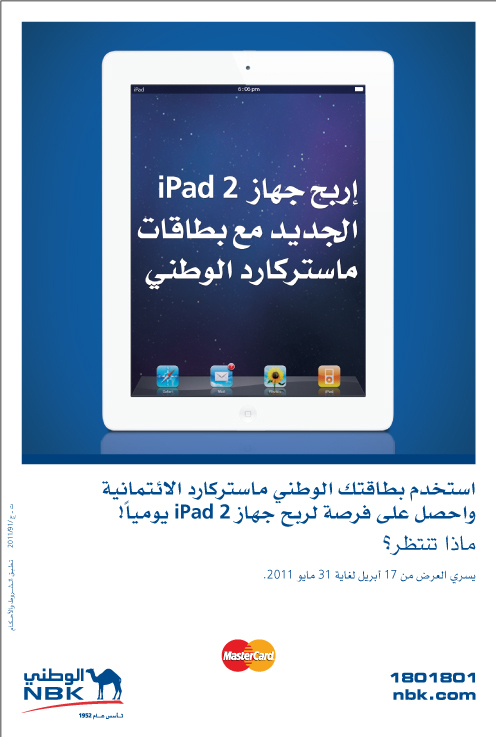 There are 45 iPad2s to be won. All you need to do is use your NBK Master card, for the value of KD 20 or more, to enter this special new draw. Double your chances with their participating outlets. There will be a daily draw, with the first one on April 24th. I know a special someone who’s birthday is on April 24th, and it would be so lovely to win this for him (winking for NBK to fix the draw for me, and save me some money). 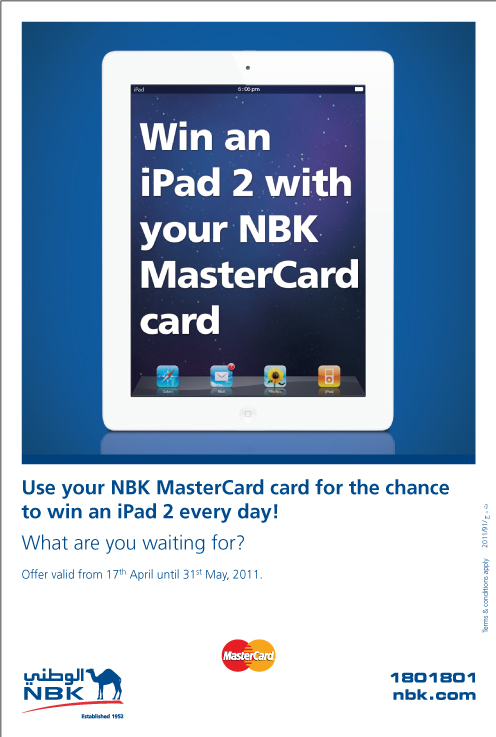 We’re offering our customers a chance to win an “iPad 2” every day when they spend KD20 or more on their NBK MasterCard credit card in Kuwait or abroad. They can double their chances by using their NBK MasterCard card at any of our participating outlets. 45 iPads to be won! Our first draw will be held on April 24th. Thank you Ms. Baria from NBK. I posted about NBK’s annual Walkathon a few weeks ago, and just wanted to remind you this is the last week to register. It ends on Friday the 11th. Registration is beside the Scientific Center in Salmiya. Also, one of my dear readers (cute Ms. N.) just informed me that you can also register at NBK-Avenues, where they have a small stand there. The Walkathon is next Saturday, March 12th. Don’t miss out on a great family-fun-filled day. Thx to Ms. Badria from NBK. 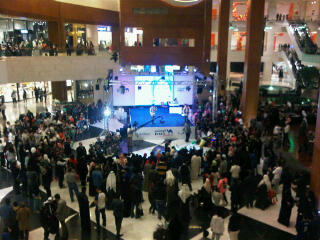 NBK kids stars! 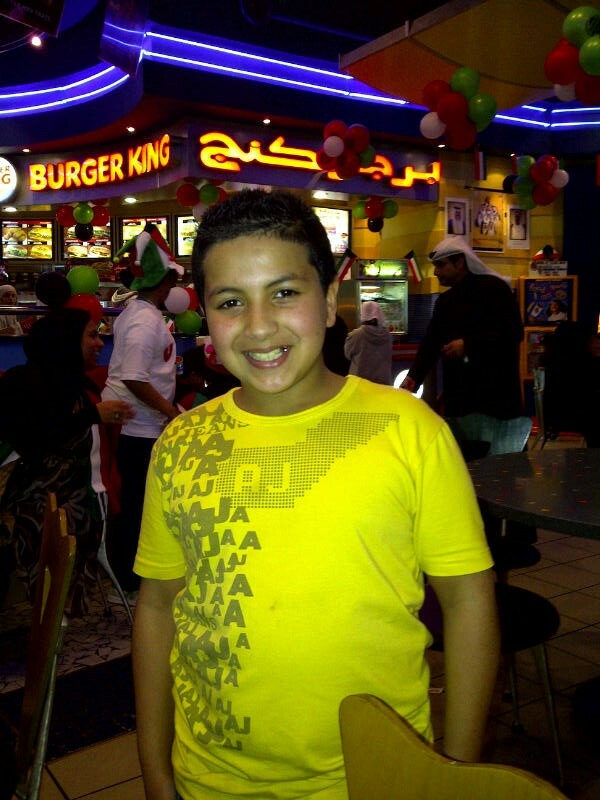 In Pizza Hut, Souq Sharq! 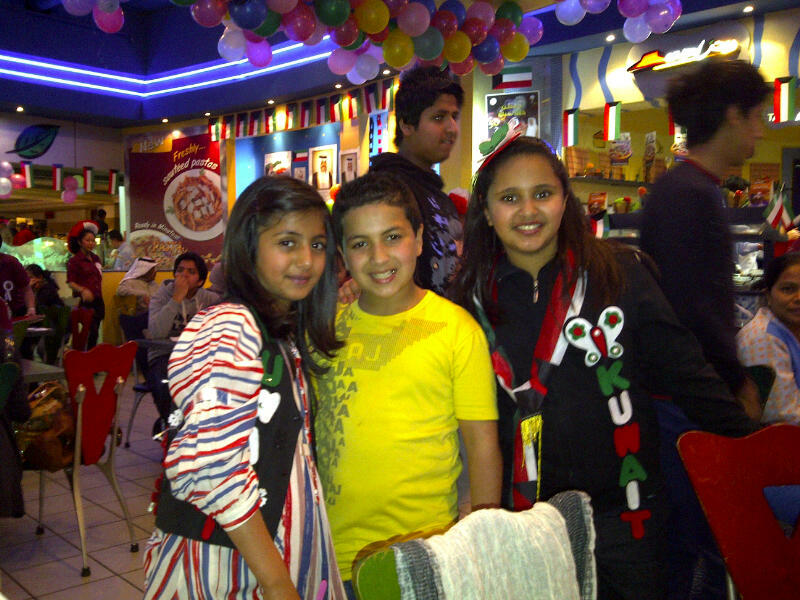 The kids are so friendly and sweet, and the boy was mashalla ya7lailah eyhabbel. 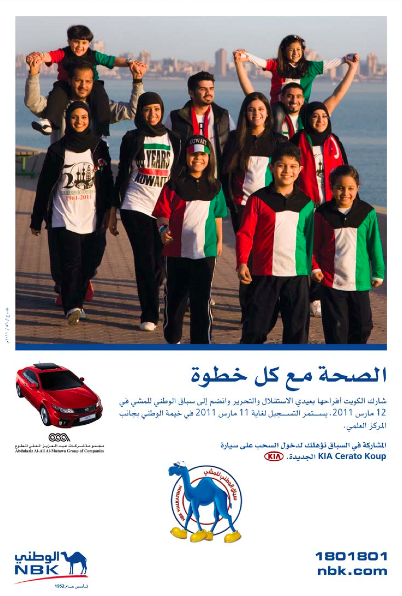 NBK’s annual Walkathon is on March 12th. Registration is open till March 11th, in NBK’s tent beside the Scientific Centre in Salmiya. I’ve been in a couple of them over the years, and they’re a whole load of fun for the whole family. We came in around 5.15 pm and got to see all the activities, from the kids dancing and singing to the Jowhara draw. I didn’t have my camera with me, but I managed to take a few stills and video. I’ll post them later when I get a chance. Would I go again? Definitely not. 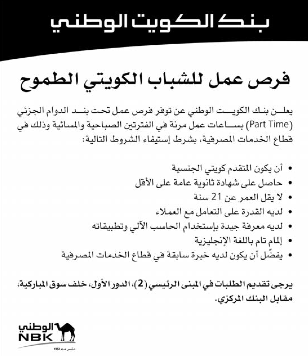 I got irritated more than a few times, and from NBK staff never the less. Ana ray7a 3ashan astanis wela at.thayag? Allah eyhadakum bs.